Social interaction is a key part of our pre-school children’s development so, around the time your baby starts to sit up, it’s worth considering joining a regular parent and toddler class. Not only will your baby be learning, but you will have the opportunity to build relationships with other parents and get some support. There are hundreds of activity classes up and down the UK, and here is a list of some of my favourites: 1. Baby Sensory classes are aimed at babies from birth and offer various activities geared to the sensory development of your baby. There are different activities each week – one week might be ‘pond dipping’, another might be a ‘country garden’ session. All the activities help develop language, physical, social and emotional skills and are fun and engaging. The weekly variety is a definite plus. 2. Tiny Talk baby signing classes have been running since 2002 when the first class was held by founder Katie Mayne. Since then, the interest in the benefits of teaching babies sign language has grown exponentially, and there are now over 100 teachers in the UK. New classes, Tiny Talk Toddlers, are aimed at developing older children’s language skills too. 3. LingoTot classes introduce children to second languages in a relaxed environment. Through play, songs and stories, Lingotots’ highly-skilled teachers will have your toddler speaking words in French, Spanish and Chinese very quickly – and it’s a great learning experience for parents too. The network of classes isn’t huge yet. but it will be! 4. There are over 700 Jo Jingles pre-school music and movement classes in the UK and Ireland. Suitable for children from 3 months to 5 years-old approximately, the classes are highly interactive with action songs and nursery rhymes galore. These are very popular, well-established sessions that everyone seems to love! 5. Diddi Dance preschool dance classes for girls and boys are designed to help develop your child’s sense of co-ordination and rhythm. Lots of different dance and music styles are explored from pop and disco to salsa. Ideally suited for 2-4 year-olds. 6. Yoga Bugs provide a wide range of yoga classes aimed at the under 2s all the way through to 12 year-olds. Yoga is a wonderful way to improve concentration and increase body confidence in children as well as helping them maintain fitness and flexibility. 7. Pyjama Drama was created by experienced drama teacher Sarah Owen in 2005. The Pyjama Drama programme is in line with the National Curriculum and has been praised for its’ positive effect on children’s development. The classes incorporate specially commissioned music and songs, movement and creative role play. 8. Some mums may have come across Mama Baby Bliss prenatal classes while pregnant but they run postnatal baby massage sessions too. You can learn how to soothe and massage your baby in a supportive environment. Founder Justina Perry’s gently holistic approach means that classes are rewarding for both parent and child. 9. The Creation Station offers arty, crafty classes aimed at encouraging your child’s creativity. Creation Station was set up by mum of three Sarah Cressall who wanted to provide creative ‘messy time’ for parents up and down the UK. The sessions are designed in accordance with the Every Years Foundation Stage framework and prepare pre-schoolers for school perfectly. 10. 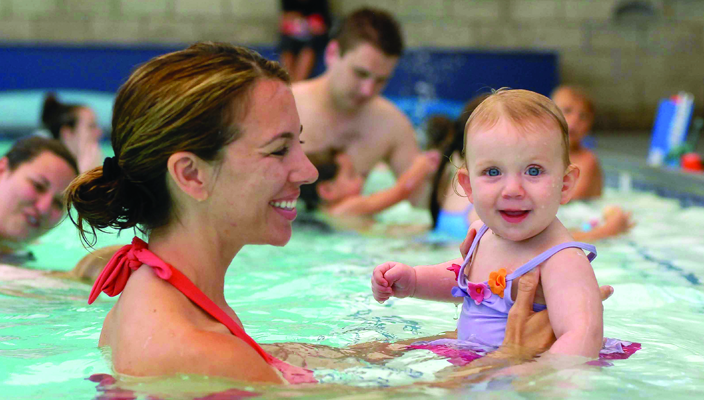 Water Babies swimming classes for little ones are available all over the UK. Their method for introducing babies to underwater swimming is very gentle and controlled, capitalizing on baby’s natural reflexes and building their confidence in the water. Swimming is a wonderful skill for children to have, and an early start is ideal. Do you have a favourite parent toddler class?